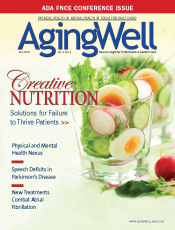 Numerous factors can contribute to older adults’ failure to thrive. Careful evaluation and intervention are essential. Early intervention is critical to help constrain the progressive decline of PD patients’ communication skills. 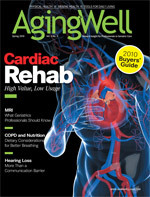 Improved techniques have increased cure rates for atrial fibrillation, but it’s critical for providers to recognize symptoms and recommend appropriate treatment. 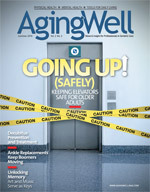 Practitioners can take measures to improve elevator safety among older adults, a population at particular risk for elevator-related injuries. Even when practitioners believe there’s no possibility of reaching elders with Alzheimer’s disease, music and art therapies can foster memory recall and promote communication. Eager to maintain their active lifestyles, boomers can take advantage of cutting-edge techniques and devices that make ankle replacement a promising option to combat ankle arthritis or injury. Consistent periodic turning of immobile elders reduces the incidence of bedsores. Learn to evaluate risks for and anticipate potential problems associated with bedsores. My Marriage or My Mom! 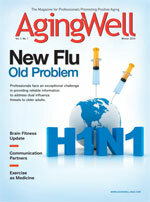 Explore the latest options and ideas unique to aging patients and clients. Communication partners create a vital link in the exchange of information for older adults whose communication capabilities are impaired by disease or trauma. Experts hold varying opinions regarding brain fitness games’ abilities to improve older adults’ cognitive skills with respect to memory and activities of daily living.